Voice & Data Cable Installation. Are you moving into a new office that needs computer and telephone wiring? Do you need cable wiring to put all of your computers on one network? Maybe you are the building owner and need to do a full voice and data Tenant Fit Out (TFO) before your new leasee moves in. Whatever your situation, Graphic Electric can provide you with the the voice and data cable installation, communication wiring, network cabling, and office electrical wiring as well as the testing needed to complete the set up. 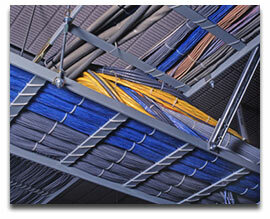 We are experts at installing CAT 6E cable for peak performance Internet and Data exchange. Because you need computers and the Internet to operate in today's business environment, voice and data installation is important to a business and are typically customized to each client's needs. Graphic Electric is fully capable of wiring a simple new office addition all the way to installing voice and data cables for your entire building. If you don't see the service you are looking for in our list above, please contact us, as most likely we can provide it to you.